Students at the Netanya Academic College in Israel gather around Rabbi Shneur Simcha Landa and his children. They have been signing up to perform mizvahs in memory of their friend and fellow student, Alon Bakal, who was slain by a terrorist in Tel Aviv. 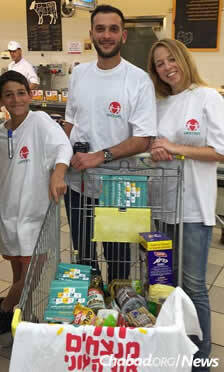 A group of students in Netanya, Israel, are working to make sure that the legacy of their friend, Alon Bakal, lives on. Bakal, 26 and a native of Karmiel in the country’s north, was shot and killed in Tel Aviv on New Year’s Day—along with 30-year-old Shimon Ruimi—by Nashat Melhem, a 31-year old Israeli Arab who also later killed Israeli-Arab taxi driver Amin Shaban. Students have been gathering at a booth on campus since the tragedy to light candles, share memories, gain strength from each other and select mitzvahs that they are pledging to do in memory of their friend. 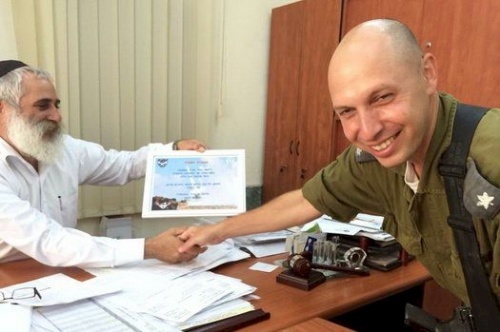 Like many Israelis, Bakal enrolled in college after service in the Israel Defense Forces, where he served in an elite unit of the Golani brigade. He had just one more month left to finish his studies and receive his law degree at the college, and was due to start a job with a law firm in Tel Aviv. Until then, he was working at the Simta bar and restaurant, which he also helped manage and where he was killed during the terrorist attack. “Alon was deeply committed to helping everyone around him,” says Shachar Debi, who was one year ahead of him in law school. “He was very sensitive to the needs of every individual, especially those whom others forgot. Debi says that Bakal was idealistic to a fault, often leading his friends in conversation about how they could make a positive impact on society. When he chose to stay in school over Shabbat, he was often the one who would chantKiddush for his friends before they’d share a traditional Shabbat meal on Friday nights after synagogue. Alon Bakal, center, was involved in many charitable activities during his lifetime. Following Landa’s lead, hundreds of students have accepted upon themselves to do additional mitzvahs in Bakal’s memory. Debi says she has accepted two resolutions, reflective of two parts of his sparking personality. She will be volunteering at a food pantry to memorialize his caring and generous spirit, and took upon herself to light Shabbat candles to honor his devotion toTorah observance and tradition. Their work reaches beyond teaching, counseling and hosting spirited Shabbat meals. Despite a stereotype prevalent in Israel that most college students come from privileged homes, the rabbi notes that many barely subside. 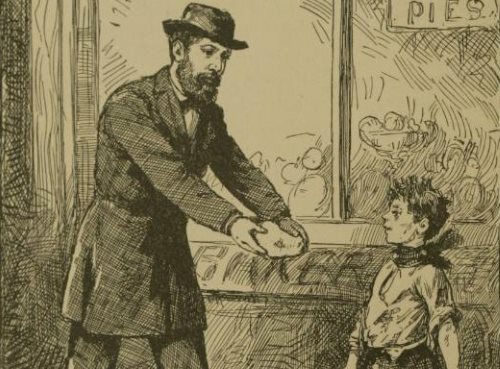 Before holidays, he raises many thousands of shekels that he uses to provide needy students with clothing and foodstuffs with which to celebrate. This past Shabbat, 20 students from Netanya participated in a Shabbaton in Kfar Chabad. The weekend’s activities were dedicated in Bakal’s memory, and there was much discussion on how to proceed despite the pain that comes with the loss of someone close. 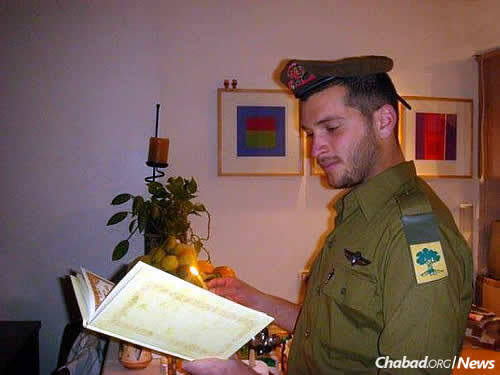 Alon Bakal fulfilled his military service as part of the Israeli Defense Forces' Golani brigade. Students have been gathering at a booth on campus to light candles, share memories, gain strength from each other and select mitzvahs that they are pledging to do in memory of their friend. 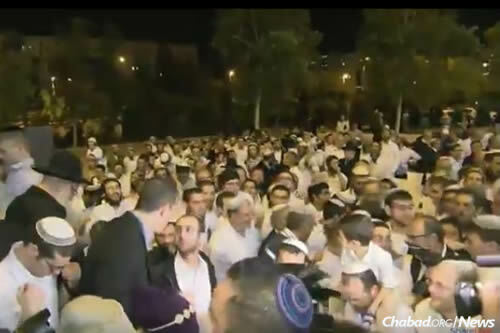 JERUSALEM—As thousands of well-wishers from around Israel and the world danced and sang outside the International Convention Center in Jerusalem, hundreds more inside could be seen crying bittersweet tears as they witnessed the marriage of Ariel Biegel and Sarah Techiya Litman, the young woman whose father and brother were murdered by terrorists less than two weeks ago. 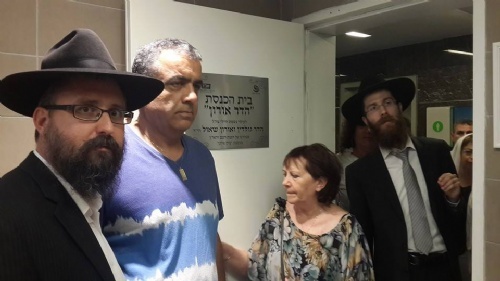 Litman’s father, Rabbi Yaakov Litman, and her brother Netanel were gunned down near their home in Kiryat Arba as they drove to a Shabbat celebration for the groom-to-be. During the shiva mourning period, the young couple decided to go on with the wedding after a brief delay, inviting people around the world to join them and fulfill the mitzvah of bringing joy to a bride and groom. Hundreds from abroad immediately responded. 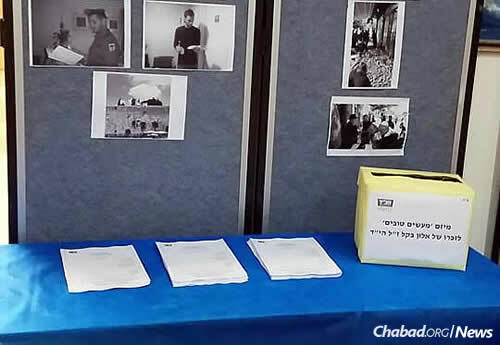 Chabad on Campus centers conducted raffles that sent a group of Jewish college students to the wedding. At Chabad centers in Melbourne, Australia, and in Ottawa, Canada—and in a number of other cities in the United States as well—individuals participated in a chance to attend the wedding and send gifts to the couple. Through the support of friends and donors, the ceremony was moved to Binyanei Hauma, the largest convention center in the Middle East. 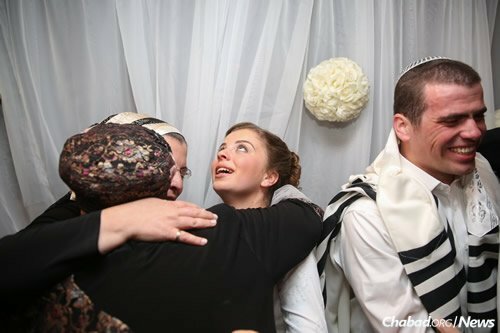 The wedding came as Jews are celebrating the Hakhel year, where unifying gatherings of Jewish men, women and children of all ages are encouraged, with an emphasis on learning Torah. In fact, the center became so packed with well-wishers that around midnight, one of the family members tearfully asked if celebrants would volunteer to leave so that thousands who were waiting outside could join in the dancing. Shortly after the ceremony, the bride and groom thanked all those who came to share in their happiness and addressed the enormous crowd that had come to support them. “Up until two weeks ago, no one knew or was interested in me and Ariel, and then in one moment on a Friday at the peak of our wedding preparations, my dad and my brother were murdered by a cruel terrorist,” said Sarah Techiya Biegel. Thousands dance outside as the wedding celebration filled the International Convention Center in Jerusalem. Out of a tragedy, a new program has been launched collaboratively between the Israeli police and Chabad Shluchim (Emissaries) around the world, with Rabbi Menachem Kutner, Director of Chabad’s Terror Victims Project (CTVP) asked to serve as the liaison. 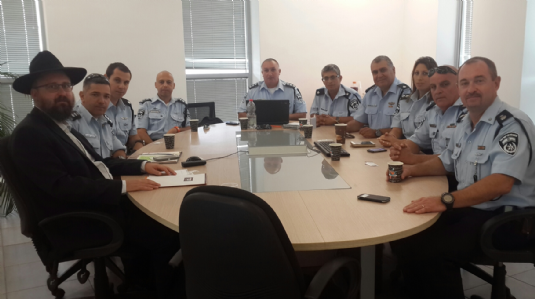 Rabbi Kutner was invited to a working meeting with the Israeli National Police Casualties Division. He introduced the officers to the work of CTVP with victims of terror and war and their families. He also familiarized them with the broad network of Chabad around the world and their dedication to the Jewish people and Jewish communities everywhere, even in the most far-flung locations. It was out of a situation that occurred to the Israeli police that the impetus for this new initiative came about. One of the officers had had the heart-wrenching job of going to a family in Israel and telling them that their daughter had died in a car accident during a trip outside of Israel. The mother became very angry and refused to accept what he was saying. She said it was a mistake, it couldn’t be her daughter, she’d just spoken with her two hours before as she was leaving on another leg of her trip. The officer realized that somehow he was going to have to find proof positive of the daughter’s tragic death in order for the family to accept it. Researching how to go about this, he was given the name of the local Chabad Shaliach in the country the daughter had been in. He called him and explained the situation and, without a moment’s hesitation, the Shaliach went immediately to the hospital late that night. He was able to confirm that this was indeed the daughter of that family. In the words of the officer: "With the assistance of the Chabad envoy, we could return and inform the family that the news is verified, and we were able to help the family during this sensitive moment even when official state bodies were not available to help us." Because Chabad has a presence all over the world – a network of staff and volunteers dedicated to the welfare of the Jewish people - they are able to help identify Israeli citizens who are living abroad – sometimes in tragedies like this, other times for a variety of other reasons in which families have to reach their loved ones. Chabad’s Terror Victims Project is proud to serve as the liaison between the Israeli police and the Chabad Shluchim around the world. It is our distinctive program of assistance to victims of terror and war and their families – and our many years of experience - that makes us uniquely qualified to carry out this important role. Chabad Terror Victims Project (CTVP) and Chabad emissaries have been actively providing comfort and solace to the unfortunate victims of the recent terror attacks. Bringing them moral support and gifts to help boost their morale and show them how much they are appreciated and cared for. For prayer and updated list of names in English please click here. For prayer and updated list of names in Hebrew please click here. Once again, Jewish people in Israel are under terrorist attack. Innocent men, women and children have been killed, and many more have been injured across the country. Some of the victims were visiting theWestern Wall to pray; some were driving their kids; others were simply heading off to work. One child was riding his bicycle. What can I do for Israel? How can I help my brothers and sisters in the Holy Land? Obviously, Israel’s government, army and police are striving to do all in their power to protect the nation’s citizens. But there is much we can do as well, no matter how distant we are geographically. The Torah teaches us (and history has repeatedly demonstrated to us) that the physical protection of each one of us — and, indeed, our very collective destiny! — is intrinsically connected to our spiritual activism. When we pray or dedicate a good deed to our brothers and sisters in Israel, we create a spiritual defense shield for them that will help them through difficult and dangerous times. In that vein, we’ve gathered some of the directives that the Rebbe, Rabbi Menachem M. Schneerson of righteous memory, shared with the Jewish people worldwide during similar events; positive action we can each take for Israel and its people. What it is: Before the outbreak of the 1967 war, the Rebbe prompted a literal “call to arms” to encourage Jewish males to don the holy heart-and-mind connectors known as tefillin, whose spiritual potency is foretold in the Talmud to help instill fear and deterrence in the enemy. What to do: Help every Jewish man and boy over the age of 13 to put on tefillin today, and every weekday. 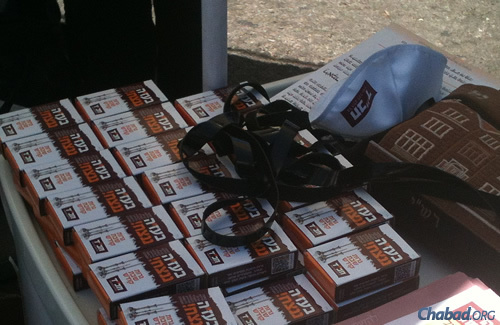 Links: Want to learn how to put on tefillin? Check out this tutorial. Don't have tefillin or seek the personal touch? Contact your local Chabad rabbi or visit a trusted Judaica source. (There a couple to choose from here. too.) Watch the Rebbe explain the power of tefillin. What it is: While this is a once-a-week mitzvah, its power lasts for an entire seven days. Lighting Shabbat and holiday candles ushers light and peace into the home and the world. 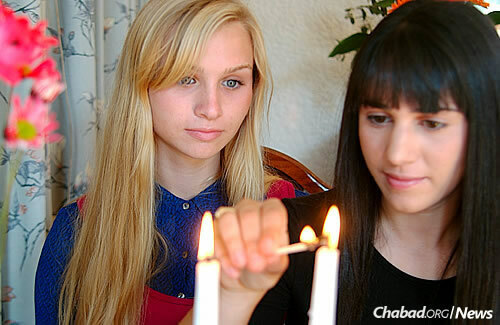 What to do: Encourage every Jewish woman and girl to light Shabbat candles every Friday before the onset of Shabbat and on the eve of Jewish holidays. Links: Learn how to light Shabbat candles, find out what time the candles should be lit, read stories and discover the power of bringing more light into the world. Watch the Rebbe discuss the redemptive power of Shabbat candles. 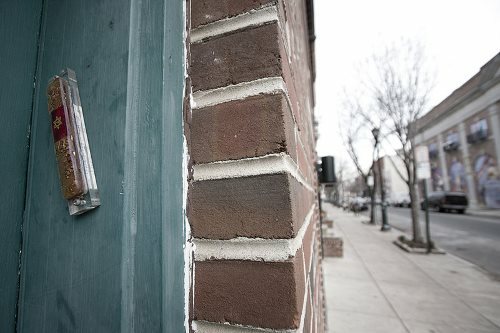 What it is: Called the “guard” of the Jewish home and the guardian of the Jewish people throughout the ages, the mezuzah is a parchment scroll containing sacred portions of the Torah that is hung on the right side of the doorpost to a Jewish home. They are also affixed on most doorposts within the home. What to do: Do you have mezuzahs on and in your home? This is a good time have them checked to make sure they are still in tiptop shape. (It is best to check your mezuzahs annually, and at least twice every seven years.) If you don’t have mezuzahs, or are missing on some doors, now is the time to get up to snuff. Links: Learn all about mezuzahs, how to affix them, and how and why to check them. Watch the Rebbe discuss the protective power ofmezuzah. What it is: The power of prayer. Our ability to reach the gates of heaven and plead with the Almighty to make things better. What to do: Dedicate a daily prayer for our brethren in Israel. Psalmsare especially appropriate for times like this. But feel free to go off-script and speak to G‑d directly in your own words, too. While praying, keep in mind those who were injured in the attacks, in addition to all of Israel. 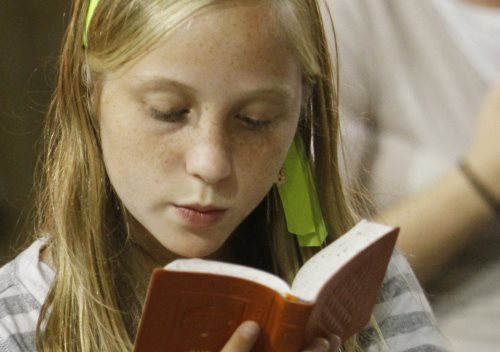 The prayer of children is considered to be particularly potent. Links: Psalms. (Chapter 20 has a special significance at times such as these.) 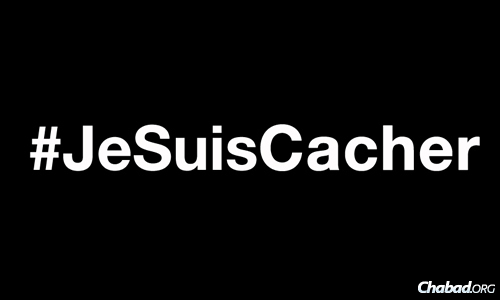 A list of victims of recent terror attacks can be found here. Watch the Rebbe discuss the potency of children's prayer in a time like this. What it is: Give charity! The protective strength of charity is considered to be particularly strong. Consider in part also our Israel-based charity. CTVP and all our staff and volunteers are working round the clock to aid those whose lives have been shattered – as well as the thousands of families living in fear 24/7. We urgently need your support at this critical time – for these recent victims and for the 3,000 families already under our care. What it is: What kept us going for thousands of years. Amid all crises, the faith and knowledge that G‑d is with us and protects us. What you can do: Reach into yourself to find your innate faith. Learn about it. Speak to your family and friends about it. Gather them around your dining room table at home or the water cooler at work, and speak about our faith in G‑d and His bond with every one of us. Engender confident trust that He will guard us, and especially in His holy land. Reach out to friends and family in Israel, or even to strangers on Facebook. Tell them that you are one with them, about the mitzvahsyou’re doing in their honor, and that you are sure that they will prevail. Links: This year — known as a Hakhel year — is especially appropriate for such gatherings of Torah, unity, and faith. Watch the Rebbe explain the immediate relevance of Hakhel to our times, and watch the Rebbe explaining the strategic importance of faith. What it is: The Torah is the common denominator that unites all Jewish people. Special Torah scrolls are being written in Israel, in which every single Jewish person may purchase a letter to become part of the Torah and unite together. Besides for fulfilling (at least in part) the Biblical commandment to write a Torah scroll, having a letter in these scrolls connects you and Jewish people all over the globe, in Israel and the diaspora, into one Torah-created unified entity. What you can do: Purchase letters for yourself and your family members, and encourage others to do the same. Links: For children, fill out this form to purchase letters (for a symbolic $1) in the special Torah for all Jewish children under bar- or bat-mitzvah age. 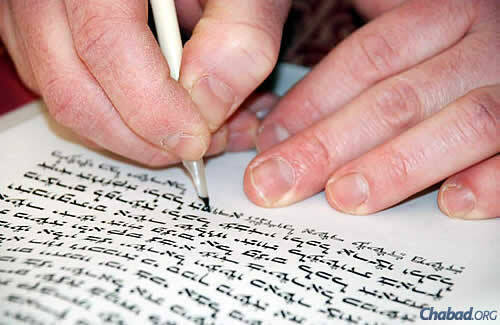 To purchase letters for Jews of all ages in a general unity Torah, click here. Watch the Rebbe discuss the unifying power of purchasing a letter in the Torah. What it is: If one deed is powerful, many deeds have an even greater impact. What to do: Forward this information to your friends. Post it on Facebook, Twitter or any other social media. Print this list and hang it in your workplace. Links: This year is a special year for Jewish get-togethers; read more about it here. Let us pray together for our brothers and sisters in the Holy Land. 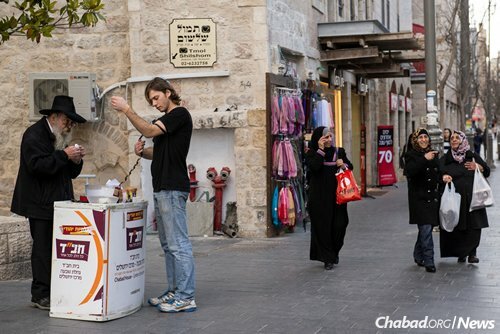 JERUSALEM—As a week of terror and stabbing attacks continued today inIsrael, the Chabad-Lubavitch Youth Organization in Israel is sending out waves of volunteers—from students to seniors—to encourage men and boys over 13 to put on tefillin prior to the start of the Jewish Sabbath. They will do so, say officials of the group (known as Tzeirei Chabad in Israel), in light of instructions given by the Rebbe—Rabbi Menachem M. Schneerson, of righteous memory—who had issued a similar call during other dangerous times in Israel. 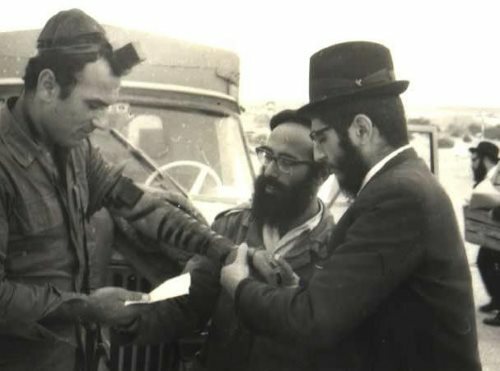 The Rebbe initiated his groundbreaking tefillin campaign prior to the outbreak of the June 1967 war, prompting an active drive for Jewish males over the age of 13 to perform the mitzvah of tefillin. Wrapping tefillin is part of the Rebbe’s 10 mitzvah campaigns introduced between the years of 1967 and 1976. Called mivtzoim (“campaigns”) in Hebrew, these 10 mitzvahs formed the platform upon which the Rebbe’s far-reaching program to revitalize Jewish life and observance throughout the world was built. Terrorist violence over the course of the week has left four Israeli Jews dead—Rabbi Eitam and Na’ama Henkin, who were shot and killed while driving with their children in Samaria; and Aharon Benet and Rabbi Nehemia Levi, who were stabbed in Jerusalem—and others recovering from knife wounds. 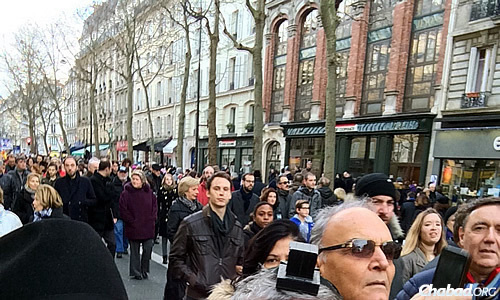 More than 1.5 million people crowded Paris on Sunday to condemn terrorism and anti-Semitism. 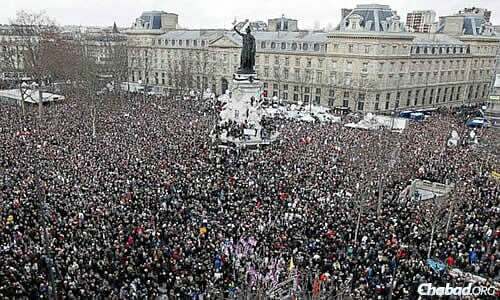 World leaders and more than 1.5 million people filled the streets of Paris on Sunday to condemn terrorism and anti-Semitism in France and worldwide. In the midst of the enormous gathering, Chabad-Lubavitch emissaries, students and volunteers were out in full force—helping men wrap tefillin, inspiring women to light Shabbat candles, and encouraging the performance of acts of kindness and good deeds, in particular, the observance of kashrut (kosher laws), following the deadly terrorist attack late Friday at the Hyper Cacher kosher supermarket. 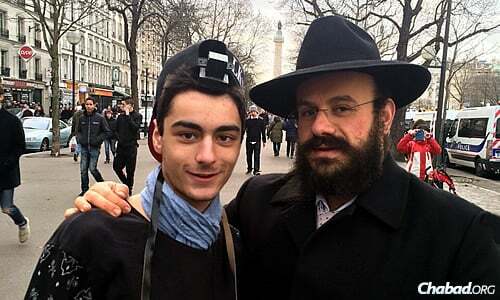 Taking their cue from the Rebbe—Rabbi Menachem M. Schneerson, of righteous memory, who taught to focus on increasing in goodness—French Jewry is spearheading a campaign to garner mitzvahs in honor of the victims. 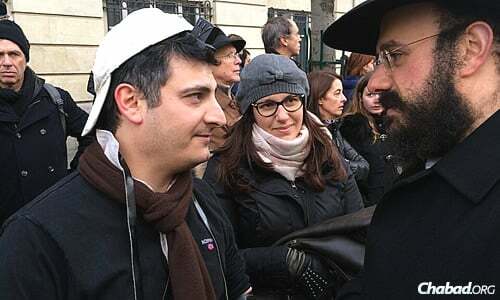 French Jewry is spearheading a campaign to garner mitzvahs in honor of the victims. “The goal is to have 1 million people accept an additional mitzvah or good deed,” explains Chabad Rabbi Chmouel Lubecki. In the midst of the crowd, Chabad-Lubavitch emissaries, students and volunteers were out in full force. 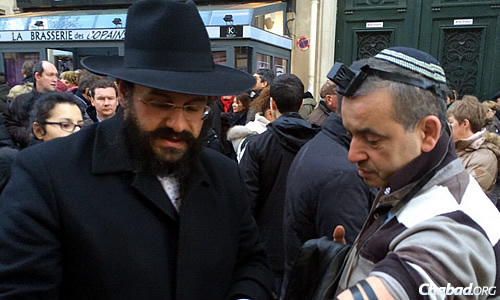 Here, Rabbi Yosef Yitzchok Amar wraps tefillin with a man in the crowd. 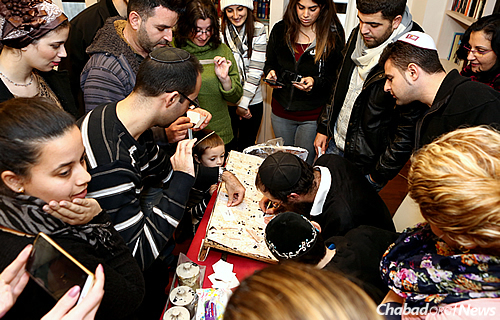 Amar and other rabbis encouraged men to put on tefillin and women to light Shabbat candles. He also encouraged the performance of acts of kindness and good deeds. 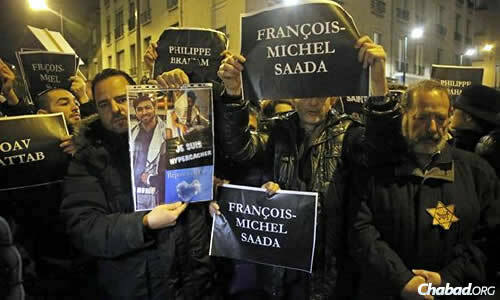 Citizens show solidarity with the four Jewish men killed in the grocery attack, including signs that read: "Je Suis Hyper Cacher." 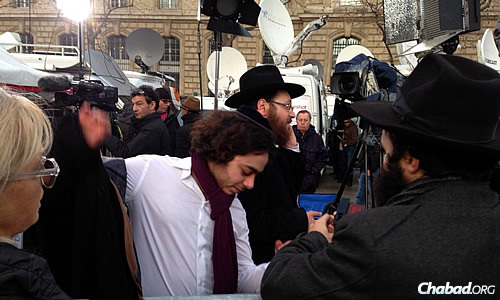 The media covered has covered a week of violence in Paris and came out to the rally in droves. Following the deadly terrorist attack at the Hyper Cacher kosher grocery, the observance of kashrut (kosher laws) was emphasized, and became part of signs and logos (“I Am Kosher”). Sefrei Torah written in memory of victims of terror in Israel are being used by Chabad Houses around the world. These Torahs were commissioned in honor of the three Israeli teenage boys abducted and killed by Palestinians this past June. 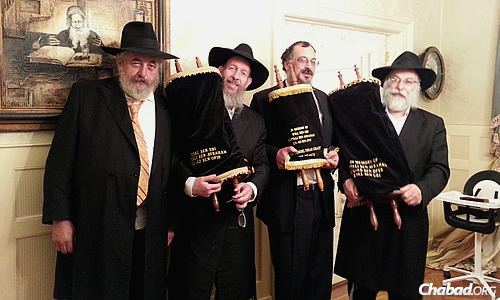 Holding them, from left, are Yankel Yankelowitz; Bentzion Chanowitz, who runs the Torah Gemach, a project of Merkos Suite 302; Yerachmiel Paskin; and sofer (Torah scribe) Rabbi Daniel Dovid Dahan. Eyal Yifrach, Naftali Frenkel and Gilad Shaar will not be forgotten. 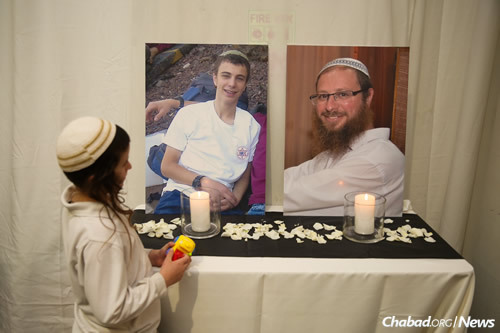 In so many ways, the worldwide Jewish community has made it a point over the last six months to remember the names and the lives of these three Israeli teenagers kidnapped and murdered by terrorists in June. The tributes have run the gamut—from the Jewish National Fund dedicating a forest of trees and creating gardens in memory of the boys to a family in Brooklyn, N.Y., naming their newborn son after them. Also in Brooklyn, the Beis Yisroel Torah Gemach—a project of Merkos Suite 302 at Chabad-Lubavitch World Headquarters in New York—immediately got to work getting three Torahs named in honor of the teens and deployed on loan to different Chabad Houses. A small Torah went to Chabad of the Big Island in Kailua Kona, Hawaii, co-directed by Rabbi Avremal and Rivka Chazanow. 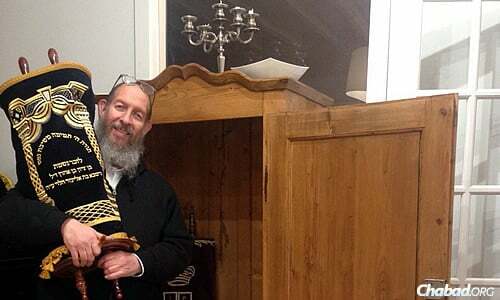 Two larger Torahs have been sent to Chabad of Olney in Maryland, co-directed by Rabbi Bentzy and DevorahStolik; andto Chabad-Lubavitch of Solano County in Vacaville, Calif., co-directed by Rabbi Chaim and Aidel Zaklos. The black-velvet covers edged in gold fringe include the names of all three boys (and their fathers’ first names), as they would have been called to the Torah: Eyal ben Uri, Naftali ben Avraham and Gilad ben Ofir. 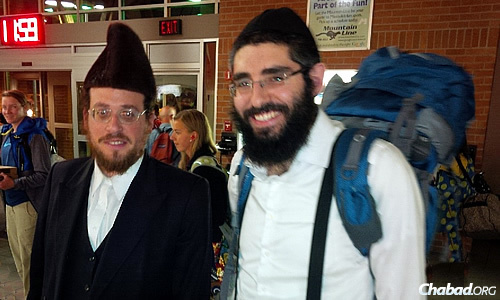 Rabbi Berry Nash, right, co-director of Chabad Lubavitch of Missoula, Mont., met mohel Moshe Roth at the airport in August when he arrived from New York to perform the brit milah for the Nashes' newborn son. Nash's father also flew in with a Torah lent out by the Beis Yisroel Torah Gemach in Brooklyn, N.Y., contained in the blue backpack. Rabbi Zaklos says his Torah arrived shortly before Rosh Hashanah, and that “it was very, very meaningful” when he presented it to the community. He says he saw tears in some people’s eyes when they heard that it honored the three Israeli teens. “We are a young Chabad House,” he explains, “and we weren’t in the position to purchase a Torah. Plus, we were in the midst of a campaign to buy a building,” which, in fact, they did just last week. This past Shabbat was the first time the Torah was used in the new building. Plans are underway for the writing of Chabad of Solano’s own permanent Sefer Torah. Leibish Nash flew into Montana with a well-packed Torah, dedicated to the 66Israel Defense Forces soldiers killed in Israel's summer war with Hamas in Gaza. Another Torah—in honor of the 66 Israel Defense Forces soldiers who lost their lives in Israel’s summer war with Hamas in Gaza—was commissioned and sent to Chabad Lubavitch of Missoula, Mont., co-directed by Rabbi Berry and Shayna Nash. They serve students at the University of Montana and the local Jewish community. 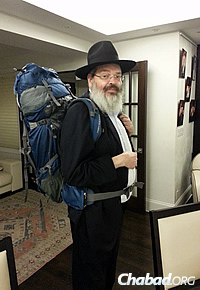 The rabbi’s father, Leibish Nash, traveled from New York to Montana with the Torah in tow, literally, in a backpack. 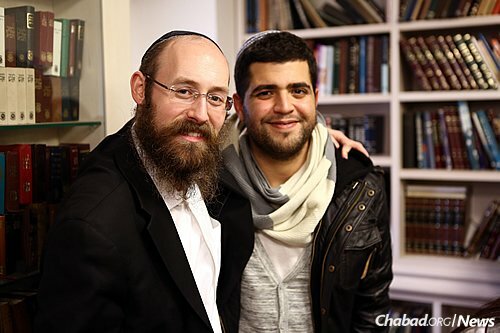 It came in time for the brit milahof the Nashes’ baby son, Mendel, on Aug. 21 (they also have a 2-year-old daughter, Riva), which was the firstminyan they had since establishing the Chabad center in May. The war ended five days later, with a cease-fire on Aug. 26. “To us, the Torah is very special and meaningful,” says Rabbi Berry Nash. “It makes us feel like we aren’t missing out on the special brachos [blessings] that we can elicit from on high. Someone from here was so excited he even prepared Maftir [the Haftorah portion] to read one week. The donor of the above four Torahs, who would like to remain anonymous, is from New York’s Upper West Side. Chanowitz holds the small Torah named for the Israeli teens, which was sent to Chabad of the Big Island in Kailua Kona, Hawaii. According to Bentzion Chanowitz, who runs the Torah Gemach, four more Torahs are getting ready to be sent to Chabad centers that need them. These are in honor of the rabbis murdered in mid-November by Palestinian terrorists in a synagogue in the Jerusalem neighborhood of Har Nof: Rabbi Moshe Twersky, 59; Rabbi Kalman Levine, 55; Rabbi Avraham Shmuel Goldberg, 68; and Rabbi Aryeh Kupinsky, 43. 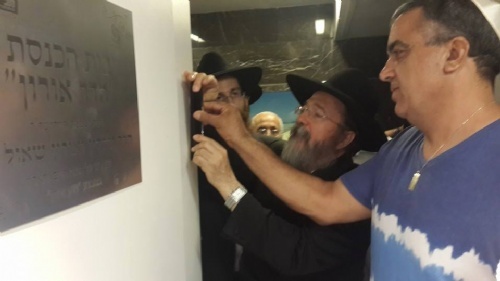 Under the direction of Chabad Shaliach Rabbi Shneur Brod and Chabad’s Terror Victims Project, a synagogue in the Ir Yamim Mall in Netanya was dedicated in memory of fallen soldiers Hadar Goldin and Oron Shaul. Named the Hadar Oron Synagogue, it commemorates these two heroic young men who died defending our precious Jewish homeland and its people. This Shabbos, our hearts and thoughts will turn to remembering Daniel Tregerman, A"H.
This beautiful four-year-old little boy was killed by mortar shells at Nahal Oz. At his funeral, his grandfather tearfully spoke of how much his little grandson loved “Shalom Aleichem” and then, in a voice cracked with pain, the grandfather slowly sang the lovely melody. When our CTVP staff went to comfort and assist the Tregerman family, they reiterated again how much "Shalom Aleichem" meant to Daniel. 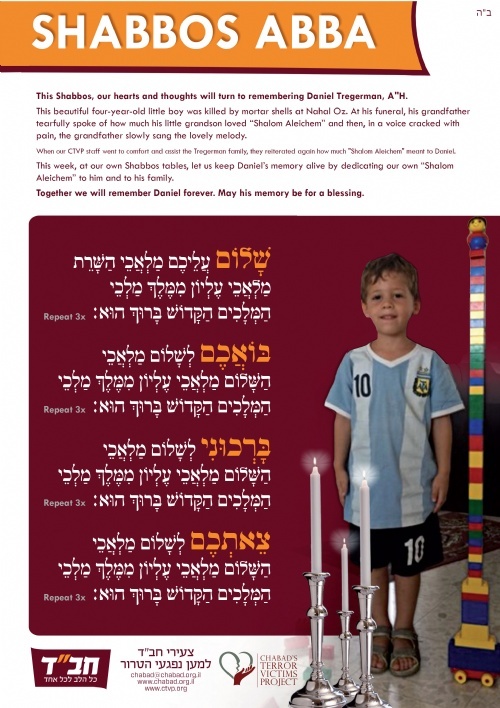 This week, at our own Shabbos tables, let us keep Daniel’s memory alive by dedicating our own “Shalom Aleichem” to him and to his family. Together we will remember Daniel forever. May his memory be for a blessing. The emails came in from around the world and in a host of languages—English, Spanish, Russian and more. Some letters were written by seniors, others by children. A few of the letters had pictures attached, others not. Most of the writers committed to doing a mitzvah, an act of goodness—be it giving charity, lighting Shabbat candles, increasing Torah study or reciting prayers. But the letters had two things in common: their message of thanks to soldiers of the Israel Defense Forces, who have been risking their lives as part of “Operation Protective Edge,” and the fact that they were written by readers ofChabad.org, who signed on to Chabad.org’s Write-a-Letter/Do-a-Mitzvah campaign to help Israel during its war with Hamas in Gaza. “As soon as the military situation in Gaza began, we knew we had to do something,” says Rabbi Mendy Kaminker, editorial coordinator of Chabad.org. “We followed the advice of the Rebbe—Rabbi Menachem M. Schneerson, of righteous memory—who always said the best way to help any situation is to increase in the performance of mitzvot of every kind. 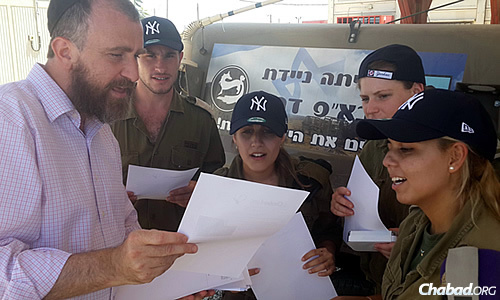 The letters were then sent to the offices of the Chabad Youth Organization in Israel, which distributed them through its Chabad Terror Victims Project to soldiers stationed near the Gaza border. In fact, whenever CTVP volunteers or staff went to visit soldiers, they handed out letters, along with other items or surprises—be it ice-cream, New York Yankees baseball caps, or bags filled with toiletries or snacks. They also felt better knowing that so many people did not pay credence to the spate of negative media aimed at Israel. “It was good for them to see that not everybody feels the same,” attests Swerdlov. That’s a message the letter-writers wanted the soldiers to understand. 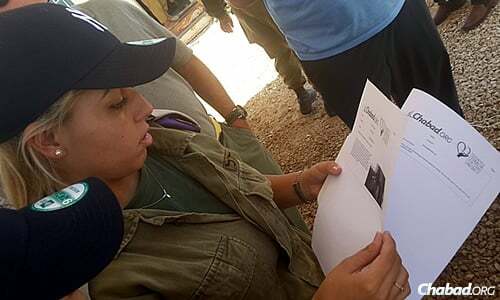 Each letter also included the writer’s email address, allowing recipients the opportunity to respond, and readers who received a reply from an IDF soldiers are encouraged to share the reply in the comments section of the page. Those wishing to join in the effort can click here to participate. 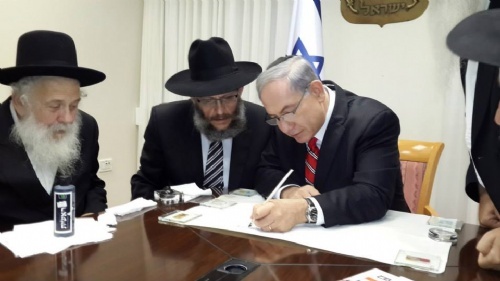 Just before attending a news conference with the international press on Wednesday, Israeli Prime Minister Benjamin Netanyahu first had some important to business to take care of: writing a letter in a new Torah scroll started by Agudat Chasidei Chabad of Israel in the merit of soldiers of the Israel Defense Forces. 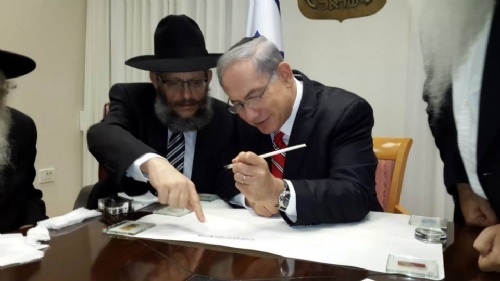 Rabbi Yosef Yitzchak Aharonov, director of the Chabad Youth Organization in Israel, invited the prime minister to hold the feather and write a letter in the first verse of the Torah. 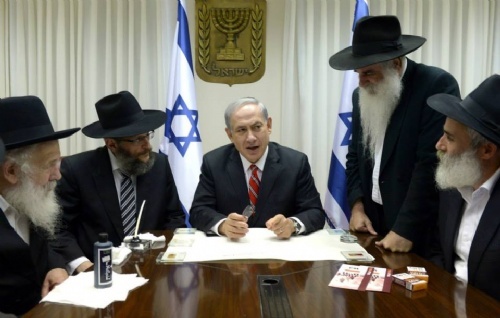 He stated that in Jewish tradition, the letters of the Torah have special protective merit. Using a quill pen, he inscribed a letter on the parchment scroll. Letters in the Torah scroll with be dedicated to each and every soldier in the IDF—those currently in service and reservists. “We all value our soldiers, our heroes who are fighting in this just fight to protect our citizens,” said Netanyahu. Also accompanying the prime minister were Rabbi Yitzchok YehudaYaroslavsky, secretary of the Association of Chabad Rabbis in Israel; Rabbi Yisrael Halperin, shaliach to Herzliya; mayor of Kfar Chabad Rabbi Benyamin Lifshitz; and Rabbi Uriel Lemberg, general-secretary of Agudat Chasidei Chabad. The premier received the tefillin with tears in his eyes. The commanders of the Iron Dome defense system in the near Kfar Chabad requested a meeting with the with Chabad representatives in order to thank them for support and visits during their stay in Kfar Chabad. 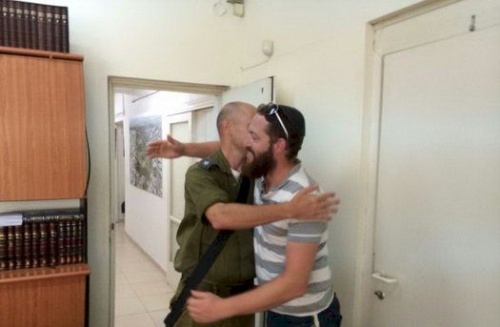 Volunteers from Kfar Chabad visited the soldiers every day, putting on Teffilin with them and bringing them food and other necessities and doing what they can to lift their spirits. They preseted Chabad with a plaque that reads “You gave us the will and the Koach (strengnth) to defend the home front,” . By Menachem Posner | July 29, 2014 10:32 AM Hundreds of brochures a day with the "With G-d's Help We Will Prevail" theme are handed out daily in Jerusalem's Machane Yehuda open air market. 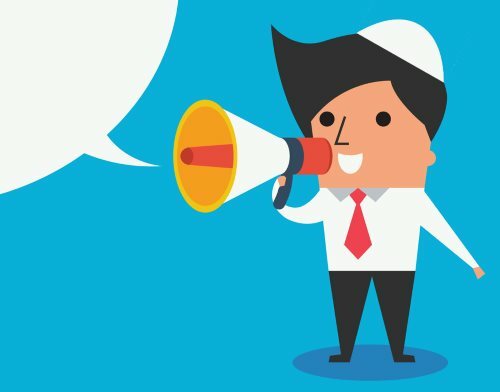 “With G‑d’s help, we will prevail” is a line popping up all over Israel: on banners hanging from porches, on the covers of information brochures, on the glossy packages of Shabbat candles—and just about anywhere else Chabadvolunteers are able to reach. 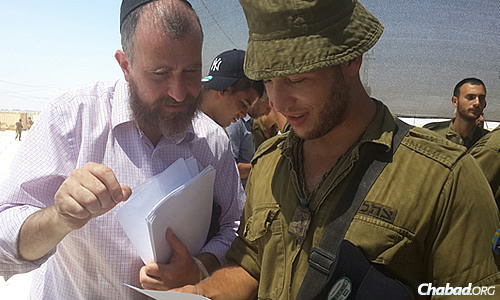 The slogan runs through the multi-pronged campaign of the Chabad Youth Organization in Israel and Chabad-Lubavitch emissaries throughout the country to bring spiritual assurance and inspiration to civilians and soldiers alike as “Operation Protective Edge” enters its third week. Central to the campaign is the new Torahscroll being commissioned in the merit of the men and women of the Israel Defense Forces. 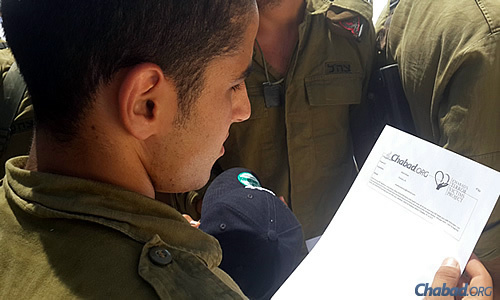 Members of the Chabad community are called upon to canvass for names of soldiers in whose merit letters will be written, and distribute forms for others to sign up a letter in the Torah scroll for them or their enlisted loved one(s). Last week, Chabad leaders met with Israel's Minister of Defense MosheYa'alon, who was the first to inscribe a letter in the new Torah scroll. Brochures with information and prayers to be said when laying tefillin, in addition to custom-made Shabbat candle kits, are being distributed with the same comforting message of hope emblazoned on their covers. A specially prepared booklet has also been published with the Torah thoughts and teachings of the Rebbe—Rabbi Menachem M. Schneerson, of righteous memory—culled from his talks and letters when Israel went through similar challenges in the past. In addition, Chabad has distributed fliers with appropriate prayers and selections of psalms to be recited in times of danger. It is accompanied with a list of wounded Israeli soldiers. Following custom, it lists their Hebrew names, as well as their mothers’ names. In Hebrew, the phrase is just three words long, Beezrat Hashem ninatzeach!. 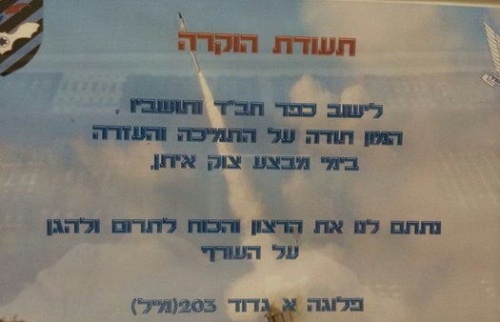 Written in short form, the first two words contract to also be read as, “In Gaza.” Thus, the double catchphrase: “With G-d’s help, we will prevail!” and “We will prevail in Gaza!" 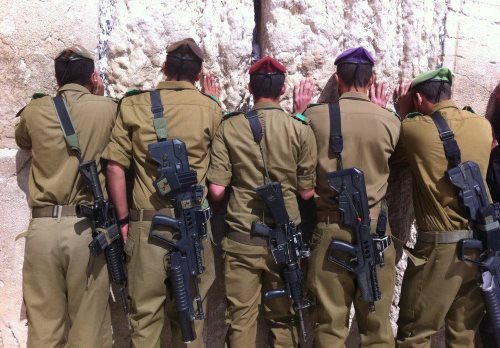 For those wishing to help in the effort from abroad, Chabad.org has set up a special web page where people can dedicate a mitzvah and write a note to IDF soldiers in general. 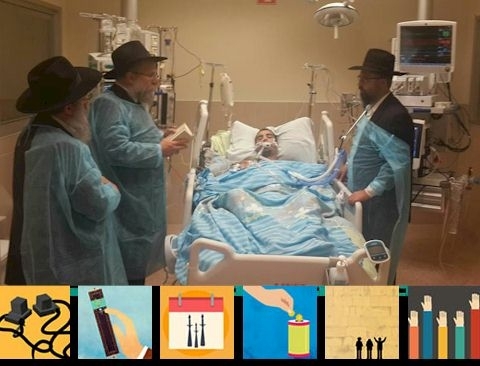 Mitzvahs and notes can be specifically directed to the wounded, and printouts will be hand-delivered by staff and volunteers of the Chabad Terror Victims Project. 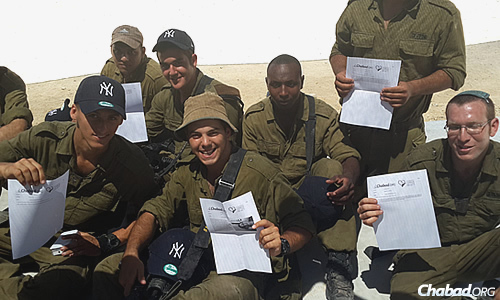 Those wishing to write a letter and dedicate a mitzvah to IDF soldiers can click here to participate. For more news, impressions, mitzvahs and prayers related to “Operation Protective Edge,” click here. 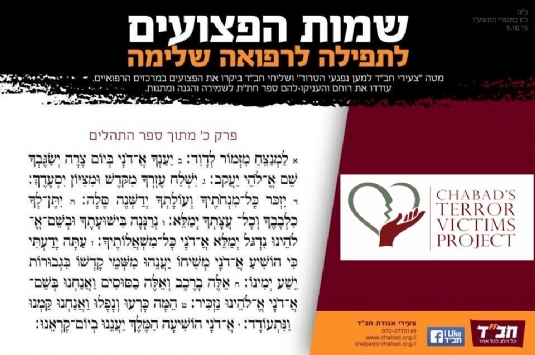 For those wishing to pray for the wounded, the following is the notice containing the Hebrew names of those who were hospitalized as of last Friday, along with their mothers’ names, which are to be used in prayers for a speedy and complete recovery. Readers can click on the photo of the ad below for a full-size image of the ad for easier viewing of the names of the hospitalized soldiers. 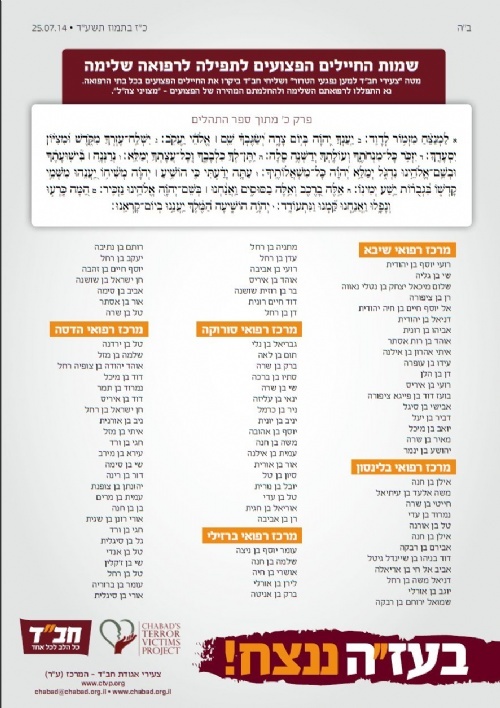 An ad in Israeli media provides the Hebrew names of the injured, along with their mothers’ first names; the hospitals in which they are being treated; and Psalm 20. 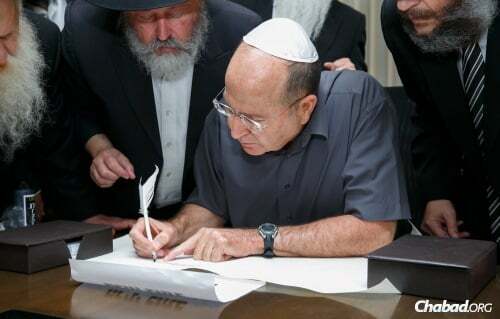 Israel’s Defense Minister Moshe “Bogie” Ya’alon set aside a few minutes on Thursday to write the first letter in a new Torah scroll being written in Israel in the merit of the soldiers. Using a quill pen, he wrote the letter bet, of the word Bereishit (“In the Beginning”) on the parchment scroll. Letters will be dedicated to every soldier in the Israel Defense Forces—those currently on active duty, as well as all reservists. The sofer, or scribe, is Rabbi Mordechai Lishner of Kfar Chabad in Israel. 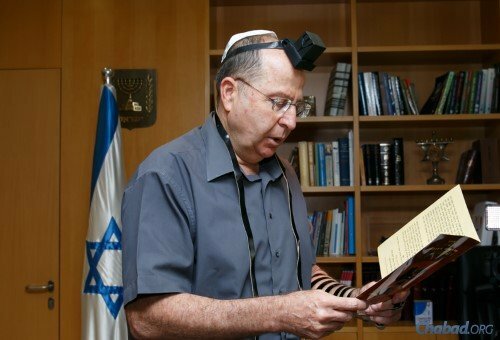 The defense minister then wrapped tefillin and recited a short prayer.